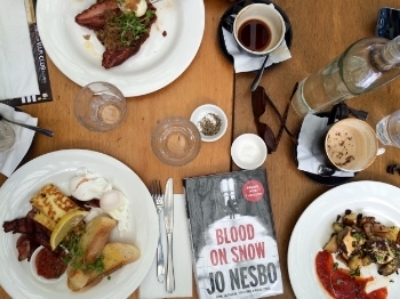 In these 200 pages Nesbø tells the story of Olav. Olav is not able to drive inconspicuously, he felt guilt after robberies, he easly falls in love withprostiturte , can not do the pusher because it is not good at math andhe read a lot but nothing very useful . But he is a ruthless and cold fixer. He had a difficult childhood with an alcoholic mother and a violent father andhe grew up alone and isolated. he is the best of Oslo when you need to fix anyone. So when David Hoffman, the big boss of heroin trafficking and prostitution discovers that his young and beautiful wife Corina has a lover, he knows who to entrust the take care of her. But Olav falls in love easily and when she sees Corina for the first time, all of his problems begin. More than a thriller, I call it a crime. There isn’t a lot of suspense as I expected, in fact it hasn’t been a page turner. I expected a love story but I did not think that was center of the book. Olav is not what I expected either. A ruthless killer and cold, but also extremely sensitive, two things that seem terribly inconsistent together. But I must say that I really enjoyed it as a character just because he is unusual. One of those people with a messed up lifethat attract problems. A villain who Nesbø wants to redeem at all costs . I loved Nesbø style . Short and simple sentences. Few descriptions. It goes straight to the point and does not provide unnecessary information. Concise and direct as Olav. I rated it 3 stars and a half for a reason very subjective. I missed the suspense, the desire to immediately resume the story . A story that starts well, got lost in the center and then recovers in a gasping final that was a low bow. But I like the style of Nesbø so much that I think I will read the other books. What is the best book of Nesbo for you?